Just like every other part of the human body, teeth tend to decay and weaken more often over time. Since some seniors are limited in activity or are not able to get around on their own, these patients may skip regular dental checkups and even routine home maintenance of their teeth and gums. It is important for seniors to know that it is never too late to preserve and protect teeth and gum health. Modern dentistry offers a variety of solutions that allow you to enjoy a healthy and beautiful smile for life. 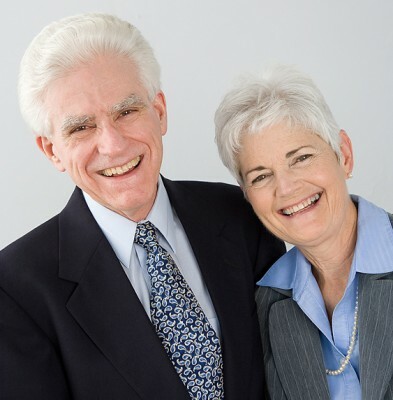 The following information discusses conditions that tend to affect seniors. Dry mouth is a common side effect of many medications, but how does it affect you? Saliva is the natural cleanser of the mouth. It buffers acid produced by the body as well as acid produced by bacteria that cause decay and periodontal disease. Patients with dry mouth are at higher risk for tooth decay and periodontal disease due to decreased saliva. Dry mouth can be exacerbated by ill-fitting dental appliances such as full or partial dentures. To combat tooth decay and gum disease when you have a dry mouth, you need to be especially careful to follow good oral hygiene habits. Brush your teeth at least twice a day – more preferably, after every meal and before bedtime. Use toothpaste that contains fluoride and also use a fluoride rinse. Drink lots of water. Keep a bottle of water with you throughout your day and rinse your mouth frequently. Visit us at least twice a year for your regular cleaning and exam. We may recommend daily use of a fluoride rinse or fluoride gel to keep your teeth healthy. Certain products are available that can help alleviate this condition such as artificial saliva replacement drops, oral rinses such as Biotene mouth rinse and Oral Balance moisturizing oral rinse. Beware that most cough drops and mints contain sugar and will cause severe decay if used daily. Excessive tooth wear can cause loss of height of teeth which can lead to jaw pain. With increased wear of teeth over time, many seniors may notice an unaesthetic appearance. Teeth can also stain. Areas where enamel is worn are excellent places for debris and plaque to accumulate and stain over the years. Also, as the protective enamel wears away, the yellowish dentin is more apparent, causing teeth to appear darker. Hypersensitivity of teeth is also common, and causes unnecessary discomfort in patients. As one ages, the incidence for decay can increase, especially at the root surface. The exposure of the tooth’s root surface can occur in seniors primarily from gum tissue receding as one ages. Root surfaces do not have a protective enamel layer and are primarily composed of softer cementum, which easily decays. Plaque and bacteria can accumulate on these surfaces, increasing the risk for this type of decay, especially in the case of dry mouth as discussed above. Since the root surface lacks enamel, decay can more easily penetrate to the tooth’s pulp (nerve), which can cause endodontic (root canal) problems and, in the worst scenarios, tooth loss. Many seniors experience a loss of their taste sensation as they age. Sometimes this is a normal result of aging. However, certain diseases and medications can also lead to taste loss. Ill-fitting dentures or other removable dental appliances can increase the alteration of taste. The most common cause of tooth loss in adults is gum disease. Bacteria create toxins which inflame and irritate gum tissue. Over the years, a slow progressive detachment occurs that also breaks down the supporting bone. Teeth are no longer held in place by bone, which leads to tooth loss, especially if left untreated. Smoking, poor diet, poor oral hygiene habits, and certain medical conditions and medications can increase your chance of having gum disease. Diabetes, age, and hereditary factors can increase your risk for gum disease as well. It is imperative that one have regular dental check-ups to determine if you have this condition and to determine what treatment needs to be done. Approximately 40% of older Americans wear full or partial dentures. Many have adapted quite nicely. However, many denture wearers have encountered problems, both emotionally and physically. Some people have trouble eating and some may have repeated sores, which can be quite painful. Ill-fitting dentures can lead to yeast infections of the mouth (oral candidiasis), increased or uneven bone loss and even cancer believed to be from chronic irritation. Missing teeth may set off a chain reaction of dental problems over time that can change your bite and develop food traps. This can cause bad breath, tooth decay, periodontal disease and bone loss. Depending on the circumstances involved, fixed dental devices, like bridges or dental implants, may be a solution to restore the function of your teeth and improve oral health. Even orthodontics may be recommended to return the teeth to a more ideal position to improve function and/or cosmetics. For more information, please visit solutions for missing teeth. 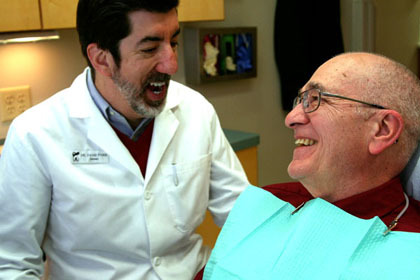 Upper or lower dentures usually are the best solution for patients with no teeth. In situations where many teeth are missing, but the remaining teeth are stable and healthy, a removable partial denture may be recommended. “Partials” allow patients to keep their remaining healthy teeth and replace missing teeth to restore form and function. Precision partials use fixed crowns and special attachments to secure the partial and eliminate the need for conventional clasping methods. The removable design of a full or partial denture allows for daily cleaning and periodic adjustment or replacement.